Plastic surgery is about more than just increasing your cup size by getting breast implants. In Florham Park, NJ, cosmetic plastic surgery can increase a woman’s self-confidence and overall quality of life. At the Peer Group, Dr. Isaac Starker has the expertise and technical knowledge women want for their breast augmentation and other body contouring procedures. When you go in for your initial consultation with Dr. Starker, you’ll have access to the latest technology with VECTRA 3D imaging, where you can see how you would look like with different breast implant sizes and types. Dr. Starker is distinguished as an Ideal Implant Premier Network Surgeon due to his experience working with IDEAL IMPLANT® Structured Breast Implants. Women can get a beautiful look and peace of mind when they choose the IDEAL IMPLANT for their breast augmentation. The IDEAL IMPLANT was created to better meet the needs of women wanting a natural look and feel, without the safety concerns associated with silicone gel implants, After ten years of development, testing, and refinement, including contributions of clinical expertise from many Board-Certified plastic surgeons, the IDEAL IMPLANT was approved by both FDA and Health Canada in 2014. Saline implants are just simple, unstructured shells filled with free-flowing liquid. These are called “single-lumen implants.” Some women complain that they don’t feel natural and compare them to a water balloon sitting on their chest. With the IDEAL IMPLANT, a series of implant shells are nested together and two separate chambers hold the saline filler. This unique internal structure controls movement of the saline for a more natural feel, while reducing folding and wrinkling, thought to be the main cause of implant rupture and deflation. This means the saline won’t just slosh and it will behave more like natural breast tissue. On the outside of the implant, the edges have been lowered for a more natural contouring to the chest wall. When comparing breast implants in Florham Park, NJ, ask to see the difference between a saline implant and an IDEAL IMPLANT structured implant. You’ll see that the IDEAL IMPLANT’s design keeps its shape better and looks more like a silicone gel implant. You and your surgeon should discuss the breast implant size that you feel is right for you at your initial consultation. Once you’ve decided on the look you want, your plastic surgeon should present that size for you to try on, look at, and feel before you make a final decision. Though silicone gel implants on the market today can get you very close to the size you want, they come pre-filled, which means once you select a size, your surgeon cannot adjust them during your procedure. The size you see is the size you’ll get. Unlike silicone gel implants, the IDEAL IMPLANT goes into your body empty, and is only filled once it’s in the correct position in the breast pocket. This allows your surgeon to adjust the saline fill as necessary, helping you achieve a beautiful, symmetrical look. Because the IDEAL IMPLANT is inserted empty, it also means the incisions your surgeon has to make will be smaller, resulting in less noticeable scars for you. You want your breast implants in Florham Park, NJ to be as safe as possible. No woman wants to stress about a leak or a “rupture” in her implants. Unfortunately, implant rupture does happen from time to time, but certain implants come with higher risk of rupture than others. Statistics from a recent eight-year study show that the risk of implant rupture with IDEAL IMPLANT after primary breast augmentation was only 2.1% in comparison to silicone gel implants from Allergan (7.4%), Mentor (13.6%), and Sientra (7.2%) based on MRI scans. Though women may have varying breast implant sizes, the IDEAL IMPLANT consistently has shown lower rupture rates when compared to silicone gel implants. Silicone gel implants can rupture silently, which means you can have a leak in your implants and not know about it. The only way to detect a rupture is with an MRI. A rupture in a silicone gel implant causes sticky, messy silicone gel to leak out into the surrounding body tissues, and some women need a complete capsulectomy to remove it. With the IDEAL IMPLANT, you’ll notice a leak by a quick glance in the mirror. If your implant does rupture, you can have peace of mind knowing that the saline solution leaking out will not cause any health complications. Your body will absorb it harmlessly and you can get your implant replaced at your convenience. Another breast implant complication many women experience is capsular contracture, where the body forms scar tissue around the implant. This can cause breast implants to displace, become firm, and potentially cause pain. You deserve an implant that can deliver lower rates of rupture, zero risk of silent rupture, and lower rates of capsular contracture. 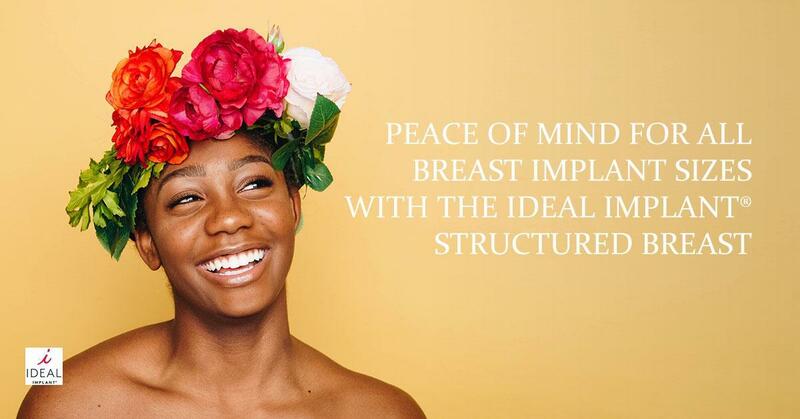 The IDEAL IMPLANT can give you the breast implant sizes you want, the beautiful look you want, and better safety features. Women who want a great breast augmentation experience and access to the latest in breast implant technology with the IDEAL IMPLANT choose Dr. Isaac Starker at the Peer Group. Dr. Starker will dedicate his time to you to observe, examine, and listen to your wishes so he can help you pick between different breast implant sizes and give you optimal results. A Fellow of the American College of Surgeons, Dr. Starker earned his undergraduate and medical degrees from New York University, and completed his general surgery training at St. Luke’s–Roosevelt Hospital. His plastic surgery residency was fulfilled at Montefiore Medical Center, the University Hospital for Albert Einstein College of Medicine. Dr. Starker is a leader among his peers and is currently Vice Chairman of the Department of Surgery of Morristown Medical Center. Dr. Starker has also served as Chief of the Plastic Surgery Section, most recently in 2014 and 2015. He has won numerous awards, and is considered a “Top Doctor,” “New Jersey’s Best Beauty Doctor,” “Best Doctor,” and “Best Cosmetic Surgeon” by various news outlets and organizations. Considering breast implants in Florham Park, NJ? Contact Dr. Starker today to discuss your options. Simply call 973-532-5101, or visit peergroupnj.com. Dr. Starker’s office is located at 124 Columbia Turnpike Florham Park, NJ 07932. Call today for more information on IDEAL IMPLANT ® Structured Breast Implants.